2005 Perth Prospector Collection: An unusual gold set. At the Midlands coin fair last week (June 2016), I was lucky enough to see a 2005 Perth Prospector Collection which I thought was fantastic. It was different from the rest and very unusual. 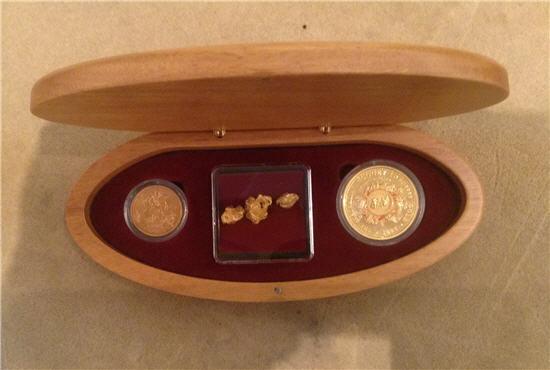 The 2005 Perth Prospector Collection consists of a Gold 1oz Prospector Nugget Coin, a 1905 Perth Mint Sovereign and 1/4oz natural gold nuggets, beautifully packaged in a wooden box. The set is part of a series of collections that celebrates the discovery of the Welcome Stranger nugget. Found in Victoria in 1869, it is the largest nugget ever found, weighing in at a whopping 2,284oz. At the time it was estimated to be worth £9,381. Today a nugget of that size would fetch about £2.7 million. The 1oz coin depicts the Welcome Stranger nugget together with some early Australian prospectors and their prospecting techniques. There is some red colours added to the coin. The obverse shows Queen Elizabeth II and is legal tender with a denomination of Aus$100. The 1905 Sovereign has a ‘P’ mintmark signifying the Perth Mint. The obverse is King Edward VII and the reverse is the classic George and the Dragon by Bernedetto Pistrucci. Only 150 of these sets were authorised, so the set is probably quite difficult to find. I hadn’t thought about it before but I was told that it’s also difficult to buy gold nuggets. My thanks to Max Hughes (MJ Hughes Coins) for allowing me to photograph the set. The set was sold at the show. AUSTRALIA, MELBOURNE MINT 1875 QUEEN VICTORIA YOUNG HEAD GOLD SOVEREIGN.